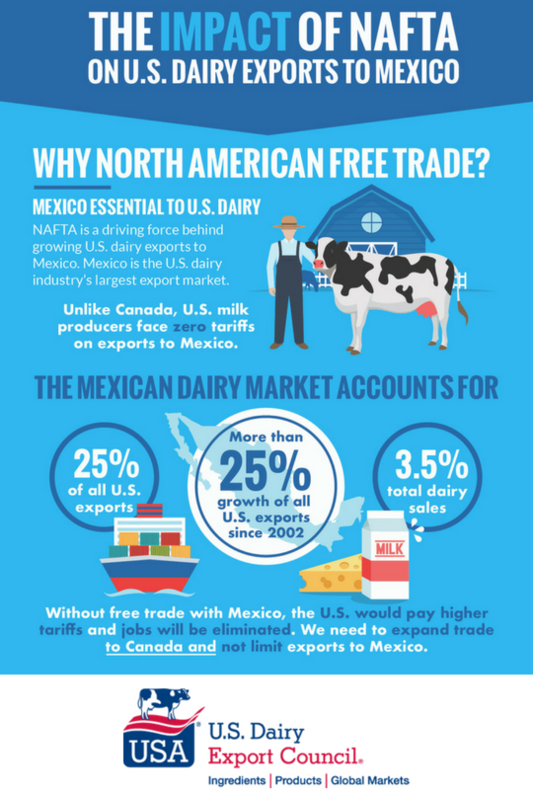 Mexico is the U.S. dairy industry's No. 1 cheese export market, accounting for 28 percent of all U.S. cheese exports. Tariffs could deliver an economic blow. Mexican tariffs on U.S. cheeses could deliver a blow to a U.S. dairy industry that creates nearly 3 million jobs and is increasingly reliant on exports. Last week, President Trump announced new tariffs on products imported from Canada, the EU and Mexico. On Tuesday, Mexico responded with tariffs on a list of U.S. products, including U.S. cheeses. The U.S. Dairy Export Council is analyzing the potential impact of the tariffs and working to mitigate their negative impact. 0406.10.01 (fresh cheese): 15 percent tariff starting June 5th; 25 percent tariff starting July 5th. 0406.20.01 (grated, shredded or powdered cheese): 10 percent tariff starting June 5th; 20 percent starting July 5th. 0406.90.04 (hard and semi-hard cheeses): 10 percent tariff starting June 5th; 20 percent starting July 5th. 0406.90.99 (other): 15 percent tariff starting June 5th; 25 percent starting July 5th. “This is a significant setback for our farmers, processors and our exporters,” said Jaime Castaneda, senior vice president for trade policy of the U.S. Dairy Export Council. Mexico is the No. 1 U.S. cheese export market. In 2017, the United States held a 75 percent share of Mexico’s cheese import market. U.S. cheese shipments to Mexico were valued at $391 million last year. Last year's U.S. cheese exports to Mexico increased 8 percent in value over 2016. Mexico accounts for 28 percent of total U.S. cheese exports. U.S. suppliers shipped 96,413 tons of cheese to Mexico in 2017. Over the last decade, both the volume and value of U.S. cheese exports to Mexico have nearly tripled. The chart below shows how Mexico is by far the largest U.S. cheese market, exceeding second-place South Korea by $178 million. Cheese and other U.S. dairy products exported to Mexico create thousands of jobs in the United States and billions of dollars in economic impact on this side of the border, according to an economic impact report. "The Impact of NAFTA on U.S. 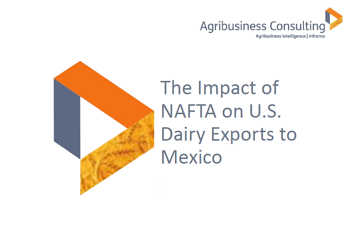 Dairy Exports to Mexico" by Informa Economics is a 35-page analysis commissioned by the U.S. Dairy Export Council and the National Milk Producers Federation. More than double the "bang for the buck"
One of the most striking findings of the Informa study is this: Every $1 of U.S. dairy exports to Mexico generates $2.50 of economic activity in the United States. That is a 150 percent return. Put another way, cheese combined with other dairy exports to Mexico give the U.S. economy more than double its "bang for the buck." Free trade with Mexico is the driving force behind nearly $1.3 billion in dairy exports to Mexico in 2017, an 8 percent increase over the previous year. Overall U.S. dairy exports to Mexico, which includes cheese, employed 16,492 full-time equivalent jobs, according to the Informa report. U.S. exports to Mexico generated an aggregate GDP of $8.4 billion over the five-year period Informa studied. When Informa included impacts to industries that are linked to dairy exports, the aggregate economic output was magnified to $23.3 billion. 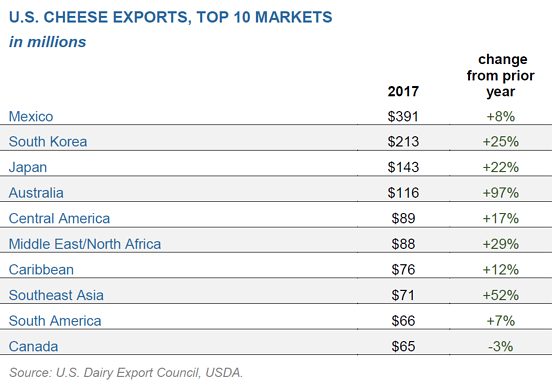 In recent years, overall U.S. dairy exports have accounted for roughly 15 percent of the U.S. milk supply. USDEC aims to increase that to 20 percent through an ambitious, industry wide goal called "The Next 5%." Any decrease in that export percentage damages a coast-to-coast industry that creates 977,727 direct jobs and 2 million indirect jobs, many in rural communities. That data comes from the International Dairy Foods Association's economic impact tool, Dairy Delivers℠. Get dairy's state-by-state economic impact, including fact sheets on exports, at a new portal, GotDairyJobs.org. Vilsack pointed out that much of the nation’s economy is linked, either directly or indirectly, to the broader food and agriculture sector, which accounts for roughly one out of seven U.S. jobs. That data is available atFeedingTheEconomy.com.